While this short clip obviously does not convey context, this teen’s tirade nonetheless symbolizes the combinations of frustration, apathy, and incompetence variously associated with the numerous stakeholders in the American education system. While significant in the bigger picture, the numerous ethical and constitutional considerations related to the State’s role in societal education are not the chief topics of concern in this post. For this narrow focus, it will simply be sufficient to illustrate that traditional arguments favoring increased roles for and presence of the federal government in education administration do not hold water from the perspective of results-based analysis. Throwing money, regulation, and one-size-fits-all solutions at the general education issue is clearly not a practicable solution at all. As with any industry, state-sponsored monopolies foster waste and abuse, which when coupled specifically with union bedfellows virtually guarantees retention and promotion of substandard and otherwise unproductive participants, correspondingly higher costs, and diminished consumer value. The special interest nature of the leviathan state’s involvement precludes elimination of this waste and unproductivity on political grounds because, in the end, efficiency and productivity (i.e., private capital maximization and consequent profit) are not the decision makers’ objective – at least not in relation to the purported stakeholders. The State’s “customers” in this sense are thus not the students, parents, taxpayers, or even society at large, but rather the various special interests involved who “pay” for their services with electoral clout, lobbying, campaign activism, and advocacy. In point of fact, the United States Department of Education (DoE), created in 1979, owes its very existence to political quid pro quo between then-President Jimmy Carter and the National Education Association, incidentally the largest labor union in the nation. To that end, it is necessary to understand whom the special interests truly represent in order to genuinely interpret the measurable results. But perhaps the programs and policies work entirely independent of these conflicting interests. This is certainly not true from a cost-mitigation perspective. As with its involvement in nearly any context, the State actually exacerbates this factor. Federal aid functions in similarly inflationary fashion with relation to tuition as federal credit “aid” (e.g., the Federal Reserve’s so-called “quantitative easing” policies) leads to general price inflation. “Studies have found that private colleges raise their prices a dollar for every extra buck students get in Pell Grants, and schools often reduce their own aid when government assistance rises.” The DoE, ostensibly created to help streamline necessary expenditures associated with primary and higher education, saw its budget balloon by over 320% in just its first 23 years of existence. And such outcomes are not just prevalent at the college level. As we have recently learned from the George Zimmerman trial, currently ongoing in Florida, one of the prosecution’s called witnesses is a 19-year-old high school student that cannot read cursive. One of the more abysmally expensive failures of the DoE is represented by the so-called Head Start program: “The most recent federal evaluation found that Head Start produces almost no lasting cognitive benefits, and its few lasting social-emotional effects include negative ones” (emphasis added). 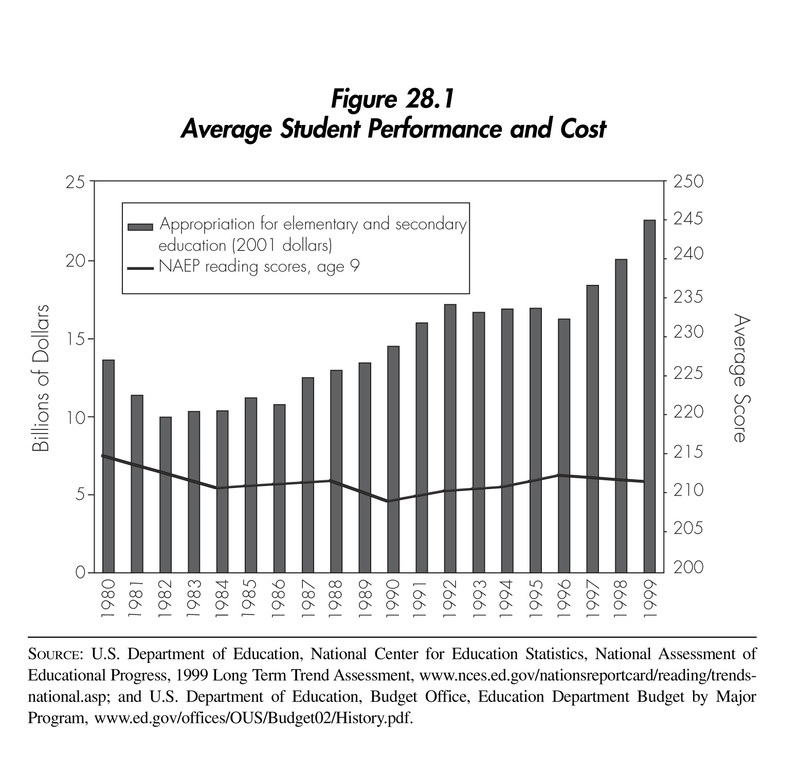 Consider the following compiled trend analysis graphic that compares DoE appropriations with overall affected student performance since the department’s inception. As one should be able to discern easily enough, there is simply no supportable correlation between increased State “investment” in education – particularly at the federal level – and actual performance results. Those in political spheres who insist that ever-growing education expenditures are either necessary or ultimately pay off are working to rationalize special interest gains or are tragically ignorant to the Sisyphean nature of the State’s bureaucratic involvement in such problems. The State’s effective monopoly on education at virtually all levels certainly provides some realizable benefits to some people and interests, but the claim that it facilitates better, cheaper results for the individual students and bill payers is just plain nonsense. This entry was posted on June 30, 2013, 1:26 PM and is filed under Constitutional Issues, Education. You can follow any responses to this entry through RSS 2.0. You can leave a response, or trackback from your own site.